It's perfect for making simple adjustments to your videos without having to pay for extra software or handle any advanced settings. Head to www.youtube.com/editor in your browser to get started. And once you're there, follow these simple tips and tricks. It's a handy tool for mixing in photos and clips to create one single video but you can also use the feature to drop in title slides you've created in a different app. Adding presentation slides is another option. The quaver musical note icon on the main menu reveals the options for adding music to your project. Unfortunately, you can't upload tracks from your own music library, but you can choose from a large selection of pre-approved licensed music from some lesser-known artists. Drag any track down into the timeline to use it, where you can adjust its length and volume accordingly. The transitions and titles options are very simple to use. Drag any of the thumbnails down into the timeline—either between two clips or on top of one particular clip—to apply the effect. The transitions include wipes, slides and fades, and in some cases you might get one or two options associated with the transition (such as the direction of the slide effect). You can easily change the length of each transition by dragging the blue sliders at each side, but you're limited to some extent by the length of the previous and subsequent clips. The titles presented by the editor are essentially templates for the text feature we looked at earlier. There are some fade and slide effects that aren't possible when using the text tool on its own, but you can't change the speed or direction of these extra effects. Use the magnifying glass icon down in the right-hand corner to zoom in and out of your project — this is particularly useful when you're trying to cut or trim scenes based on a very specific point. Both the audio you add over your clips and the individual clips themselves have independent volume controls, so use these to change the balance between the sound you've recorded and the sound laid on top. Hit the Publish button and your movie masterpiece is saved as a new video in your YouTube account. No permanent changes are made to the original clips you've used, which remain in the same state as they were before. It's not likely to challenge Adobe Premiere anytime soon, but most of us don't need that level of editing control. 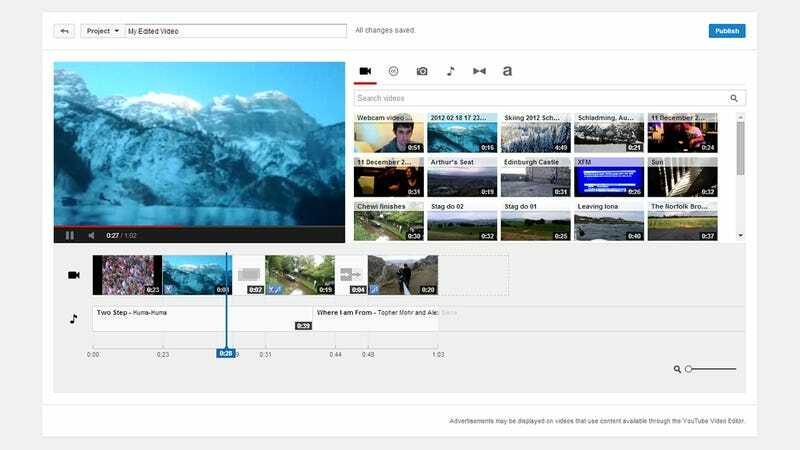 YouTube's editor is simple, effective, and runs in any browser. It's improved a lot since it first appeared too, so keep an eye on it for future upgrades.